Last year, Canadian Travel Website Cheapflights commissioned me to write an Insider's Guide to Oslo for them. I've found my calling. Researching restaurants (eating out) and researching bars (drinking beer) and researching museums was a good gig. Along the way, I wrote a little more than necessary for their purposes. Imagine that. So, I thought I'd put my full descriptions here on my blog for all my readers. To begin... What are some cool places to eat in Olso? Plant both feet in the rugged Norwegian experience with dinner at Lorry. Not only is the menu full of very Norsk food--reindeer cakes and tyttebær (cranberries)--but the drinks menu is one of the most extensive in the city, boasting over 100 types of beer. The food isn't special beyond being true to the region, but the atmosphere is what people flock for. Dark paneled walls, working fireplaces, and high-backed booths keep things cozy. A staggering collection of stuffed and mounted wild animals--giraffe, zebra, bear, and moose--cover the walls and loom in the corners, giving Lorry the effect of a 1920s hunting club. Lorry is located less than a block from the Royal Palace, giving visitors a perfect place to walk after enjoying a hearty, heavy meal. You'll find this colorful restaurant only a few blocks from Oslo Central Station, and smack in the middle of Oslo's vibrant Grønland neighborhood. SAWOL is all about soul food, and the native New Yorkers who established the restaurant stick to this vision dutifully. Their menu includes everything from breakfast burritos to macaroni and cheese. Depending on the season and the whims of the chef, you may find traditional chili and cornbread or fried chicken on the specials' board. And don't forget to try a big slice of homemade pie for dessert! SAWOL is on the second floor, and visitors can take their meal inside, where the vibe is that of a classic diner, or out on a large patio, under strings of lights and brightly-colored umbrellas. The food is delicious and generously presented, and, after some very serious research on my part, I can tell you they serve the best milkshakes in the city! So, you're a week into your trip to Norway and you're down to your last pair of clean socks. Swing by Café Laundromat in Oslo's St. Hanshaugen neighborhood. The place is a zany mash-up of services: good food, "state-of-the-art" laundry facilities, and one of the largest private libraries in the city. The walls are lined with bookcases holding more than 4,000 books in several languages. 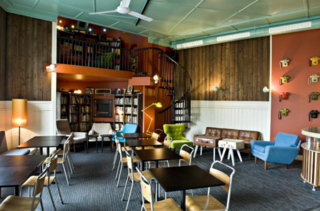 The café is a hipster paradise; you'll think you walked into an Instagram photo. Vintage phones are attached to the walls; battered 1970s living room furniture is arranged for optimum conversation-space. But there are also many tables and chairs set up for regular dining, and you don't need to do laundry in order to enjoy your Laundromat experience. They open early and serve a terrific breakfast; if you order the apple pancakes, you'll have a tough time finishing them by yourself! Laundromat's beer list is also impressive, if expensive, featuring several Norwegian brewers (Haandbryggeriet, Nøgne Ø, and Ægir), but also beers from around the globe. Get outside the bustle of the main city with a visit to the Frognerseteren, the "high summer pasture" above Oslo. Take the Number 1 Metro to the end of the line and follow a short path downhill to an imposing wooden building. Traditional ornamentation above the doorways is reminiscent of the prows of Viking ships. 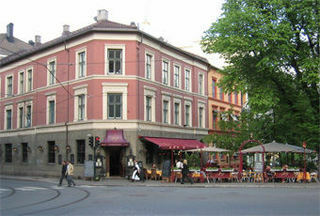 The building houses two restaurants: one is the expensive and elite Finstua, and the other is Café Seterstua. Of the two, I prefer the café. The service is cafeteria-style, which makes for a quicker dining experience. You can choose from a very traditional Norwegian menu, including everything from rømmegrøt (sour cream porridge) to meatballs and creamed cabbage. Weather permitting, take your trays onto the terrace where, on sunny days, the view of Oslo and the Oslofjord is spectacular. 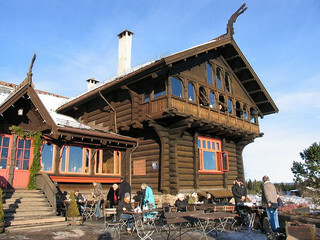 The café is open in summer and winter, and they have a wonderful selection of pastries and baked goods, too. My favorite is their quiche. Frognerseteren's location is also a trailhead. From the restaurant there are lots of well-marked, easy trails downhill, to be hiked in summertime and cross-country skied in the winter. When visiting a new city, it's easy to appreciate from within, but it's also fun to get outside the limits and see things from another angle. 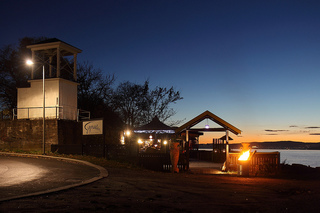 Take the ferry from Aker Brygge, the main wharf, to the tip of the Nesoddtangen peninsula. The menu at Signalen offers a wide variety of standard and regional fare. Most of the restaurant is indoors, but some seating is open to the water. Ships, ferries, and sailboats will float past as you enjoy your meal, and across the water you'll see Oslo's sparkling skyline.